MEZESsf introduces traditional all-natural Greek spreads for retail and foodservice. When Chef Nikos Maheras moved to California from his home outside of Athens, Greece, he wanted to introduce the Greek flavors and spices he grew up with to the San Francisco Bay area, while also promoting healthy and tasty nutrition habits. The company’s first two products are dairy spreads. The Htipiti (pronounced tee-pee-tee) is Greek feta cheese, roasted red peppers, Greek yogurt, Greek olive oil and spices. A 2-tablespoon serving contains 60 calories, 5 grams of fat and 2 grams of protein. The Tzatziki is Greek yogurt, cucumbers, Greek olive oil and spices. A 2-tablespoon serving contains 35 calories, 4 grams of fat and 2 grams of protein. The spreads contain no preservatives, added sugars or gluten and are made with non-GMO ingredients. They come in 8-ounce retail cups with a suggested retail price of $5.99 to $6.99, and gallon foodservice pails that sell for $48. For more information, link HERE. 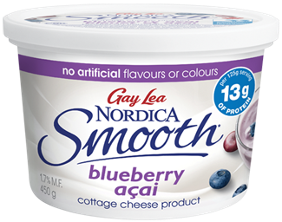 Gay Lea Foods grows its Nordica Smooth Cottage Cheese line with Blueberry Acai. Nordica Smooth was the first of its kind to launch in Canada four years ago. Like the other products in the brand, Blueberry Acai uses only natural flavors. The product comes in 450-gram multi-serve containers. Packed with protein, Nordica Smooth Blueberry Acai has all the benefits of cottage cheese without the lumpy texture. The company was mindful of sugar content, so each serving actually has more protein than sugar. A 125-gram serving contains 120 calories, 2 grams of fat, 13 grams of protein and only 11 grams of sugar. 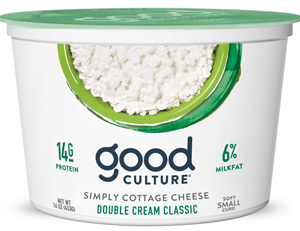 Good Culture brand adds keto-friendly cottage cheese variety. New Simply Classic Double Cream 6% Milk Fat cottage cheese delivers 14 grams of protein per serving. The “simply” position is designed to satisfy consumers’ desires for real food with high protein with less sugar and simple ingredients. Made from pasture-raised milk from free-roaming cows on sustainable family farms, the cottage cheese is also loaded with live and active cultures, and contains no additives such as stabilizers, thickeners or artificial preservatives. Good Culture was co-founded in 2015 by Jesse Merrill and Anders Eisner, who saw a gap in the market for high-quality cottage cheese that had the potential to lead the real food movement. 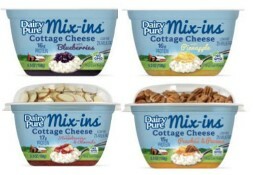 Dean Foods grows its DairyPure Mix-ins line of cottage cheese. DairyPure Mix-ins launched in 2018 with four fruit flavors: Blueberry, Peach & Pecan, Pineapple, and Strawberry & Almond. The brand is now expanding with two savory flavors--Creamy Jalapeño & Tortilla Strips and Sundried Tomato & Croutons—and adding another fruity option: Blackberries & Granola. DairyPure Mix-ins is a low-fat, high-protein cottage cheese product packaged in single-serve containers, making them convenient for on-the-go snacking. DairyPure is supporting the launch with an integrated marketing campaign, which includes engaging digital ads, in-store shopper promotions, social media content, and earned media and influencer programs. The campaign’s overall creative theme showcases the simplicity of mixing in the good stuff for a sensational, protein-packed nutritious treat. DairyPure Mix-ins have no artificial flavors, sweeteners or artificial growth hormones, and are backed by DairyPure’s exclusive 5-Point Purity Promise. 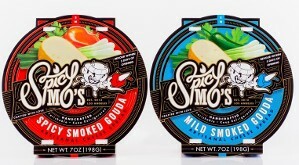 El Segundo, Calif.-based Spicy Mo’s is expanding distribution of its handcrafted cheese spreads, which are made with artisanal smoked gouda cheese blended with locally sourced spices, cream cheese and fresh mayonnaise. Current distribution is Southern California, Las Vegas and the greater Phoenix region. The gourmet spreads come in Spicy and Mild varieties. The all-natural spreads are sold in 7-ounce containers intended for consumption after five days of opening. They are that fresh! The spreads are great on crackers and with crudites, or even as a topping on pasta, vegetables or center-of-plate protein. A 1-tablespoon serving contains 60 calories, 5 grams of fat and 3 grams of protein. 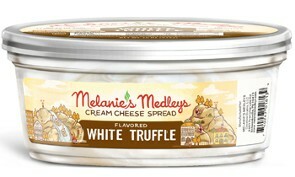 Melanie’s Medleys grows its cream cheese spreads line. The clean-label, small-batch cream cheese now comes in Garden Vegetable, Honey, Fig & Pistachio, Jalapeno, Mixed Berry, Triple Onion and White Truffle. The new flavors are making their debut exclusively to Whole Foods Markets in the Mid-Atlantic region. The 7.5-ounce tubs of gluten-free spreads contain no artificial colors, flavors or preservatives and are made with all non-GMO ingredients. Aldi offered three Park Street Deli Specialty Dip varieties this winter season. Based on cream cheese, the dips come in Bacon Cheddar, Buffalo Style Chicken Blue Cheese (made with all white meat chicken) and Caramelized Onion varieties. The dips can be consumed right from the refrigerator or warmed in the over or microwave. They can also be used as cooking sauces---warm or cold—over pasta, with vegetables and in casseroles. A two-tablespoon serving contains 80 to 130 calories. They are sold in 16-ounce deli-style square containers for $3.79. 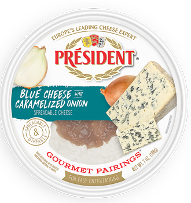 Lactalis Group introduces Président Gourmet Pairings. The line is debuting in three flavor combinations: Feta with Roasted Red Pepper, Blue Cheese with Caramelized Onions and Aged White Cheddar with Apple Chutney. The smooth and creamy cheeses with culinary-inspired gourmet toppings are for spreading and dipping. They come in 7-ounce tubs intended for merchandising in the specialty cheese department. The ready-to-serve packaging is designed with a clear, semi-circle, cut-out window for visible toppings and a clean aesthetic for easy display. 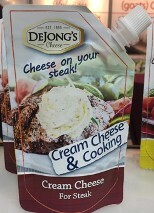 DeJong Cheese of The Netherlands is rolling out Cream Cheese & Cooking. Multi-use recloseable squeeze pouches feature flavored cream cheeses intended for use as a meat or fish topping, or to be used in the creation of sauces or other creative cooking applications. For steak, there’s a chili curry-flavored cream cheeses. For chicken, there’s tandoori-flavored cream cheese. For fish, there’s furikake-flavored cream cheese. Yofir is a combined product of yogurt and kefir, and includes extra probiotic cultures in order help boost immunity. Yofir comes in four varieties in 150-gram cups. They are: Apple and Muesli; Avocado, Mango and Orange; Passionfruit; and Strawberry. 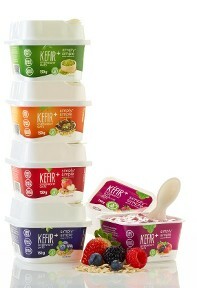 The product joins the Estonian company’s other kefir products. The Kefir Dessert line now has a Mixed Berry variant, joining Blueberry and Peach. There’s also new Kefir Marinade, a liquid seasoned kefir intended to be poured over raw meat and allowed to soak in the refrigerated for an hour before cooking. The kefir tenderizes the meat. The remaining marinade can be cooked into a sauce. Saputo Dairy Foods USA introduces Friendship Dairies Fruit on the Bottom cottage cheese snack. The 1% milkfat cottage cheese line comes in 5-ounce cups in three varieties: Peach, Pineapple and Strawberry. The new campaign continues the agency’s strategy to avoid cottage cheese category clichés. In 2017, the campaign for the brand’s multi-serve cottage cheese products was called Share Friendship. It celebrated the power of friends connecting, demystifying a product category that has been associated with ‘70s-era bland dieting. The video series showed that the “Power of Friendship” can convert cottage cheese haters to lovers when they are tricked into trying a recipe made with cottage cheese. The new campaign’s videos, print and radio executions are on social video channels and digital/online, and further being promoted through a network of influencers, public relations, local radio, email and in-store display. To read more about this product, link HERE to the October 5, 2018, blog titled "Cheese Innovation: Curds Come in Many Ways." 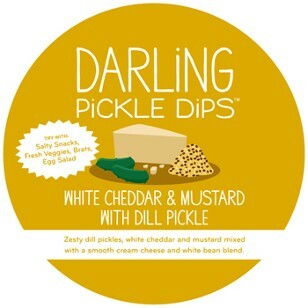 Darling Foods offers Darling Pickle Dips, a line of refrigerated dips made from a cream cheese and white bean base. The base is blended with pickled vegetables, herbs and spices into four varieties. They are: Fiery Jalapeno & Roasted Tomato, Original Dill Pickle, Spicy Pickle and White Cheddar & Mustard. The cream cheese gives the dips richness, while the pureed beans provide a slightly chunkier texture than most creamy dips. Each variety has some taste of dill pickle without being overwhelming. 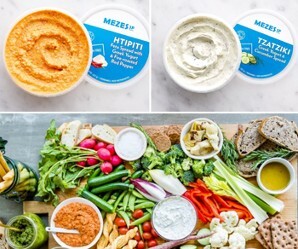 The dips were developed by two life-long friends--Sara Doherty and Britt Jungerberg—in their quest for something different and better-for-you in the premium dip category. Darling Foods LLC is one of six dairy companies recently selected to participate in the 2018 Land O’Lakes Inc., Dairy Accelerator, a program supporting the dairy industry by providing tailored coursework and mentorship to dairy entrepreneurs. To qualify for consideration, each company was required to utilize dairy as a primary ingredient in their products. Throughout the three-month course, participants will meet with both Land O’Lakes and external business mentors and will attend seminars focused on topics including finance, brand building, sales and leadership development. General Mills introduces Liberté Skyr. This Icelandic-inspired yogurt contains either 19 grams (plain) or 17 grams (raspberry and vanilla bean) of protein per three-fourths-cup (175 grams) serving. Sold in 500-gram multi-serving tubs, Plain has no added sugars. A serving contains 140 calories, 3.5 grams of fat and 5 grams of sugar (from inherent lactose). A serving of Raspberry or Vanilla Bean contains 150 calories, 3.5 grams of fat and 10 grams of sugar. 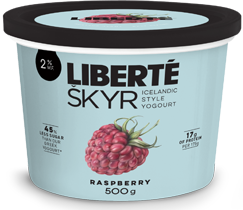 New Liberté Skyr contains no preservatives, food additives, artificial coloring or gelatin and is certified kosher. 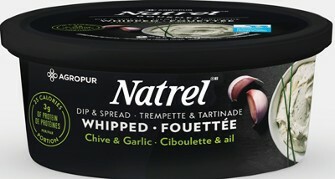 Agropur introduces Natrel Whipped to the Canadian market. The new cultured dairy product is made from low-fat cottage cheese and functions as both a dip and spread. The curds and cream are whipped to a smooth, creamy texture and come Plain or with seasonings. The two seasoned varieties are: Chive & Garlic and Roasted Red Pepper. The product comes in 250-gram tubs. High in protein and low in calories, a 2-tablespoon (30 grams) serving contains 25 calories, 0.5 grams of fat, 1 gram of sugar and 3 grams of protein. 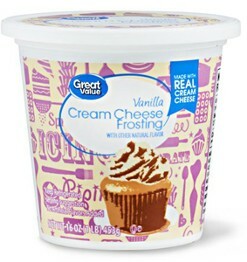 Walmart introduces Great Value Cream Cheese Frosting in vanilla and chocolate varieties. This smooth and creamy refrigerated frosting can be spread on brownies, cupcakes and cookies, or simply enjoyed by the spoonful. For best results, soften frosting at room temperature for at least 30 minutes before spreading. It comes in vanilla and chocolate varieties and is sold in 16-ounce recloseable tubs. The frosting is merchandised alongside other refrigerated cream cheese products. Cream cheese is the first ingredient. A two-tablespoon serving contains 140 calories. 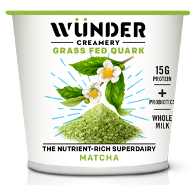 To read more about this product, link HERE to the August 17, 2018, blog titled "Selling Dairy Proteins and Milkfat: An Opportunity in Cottage Cheese and Quark." Green Valley Creamery, formerly Green Valley Organics, continues to expand its award-winning line of lactose-free, real dairy products with the introduction of organic lactose-free cottage cheese. It is made with simple, clean ingredients--organic milk and cream, Celtic sea salt, lactase enzyme and live, active cultures—and has a rich, creamy taste and mild cultured flavor. With 4% milk fat, the cottage cheese contains no additives and is made without any gums, stabilizers or preservatives. Each serving provides 12 grams of protein and only 3 grams of carbohydrates. The suggested retail price for a 12-ounce container is of $5.29. All of Green Valley Creamery’s lactose-free dairy products are certified organic, kosher and gluten-free. The company uses a simple enzymatic process to break down the lactose in milk and cream, leaving its nutritional value intact. This renders the milk free of lactose and digestible to even those with severe lactose intolerance. Kraft Heinz introduces Philadelphia Dips. 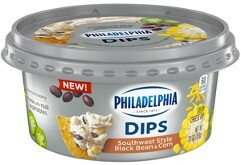 With Philadelphia cream cheese as the base ingredient, the new dips are loaded with robust ingredients. The four varieties are: Buffalo Style with Celery, Jalapeno Cheddar, Southwest Style Black Bean & Corn, and Spinach & Artichoke. The dips come in 10-ounce containers. A 30-gram serving contains 50 to 70 calories, 4 to 6 grams of fat, and 1 to 2 grams of protein, depending on variety. 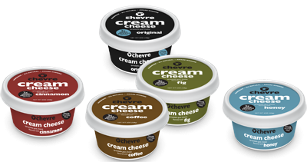 Belle Chevre introduces Chevre Cream Cheese. The spreadable cream cheese is three times higher in protein than regular cream cheese. The spread comes in five varieties—Cinnamon, Coffee, Fig, Honey and Original—in 6- ounce plastic tubs. A 2-tablespoon serving contains 6 grams of protein, less than 8 grams of fat and only 100 calories. Arla Foods introduces Arla Skyr Cream Cheese, a better-for-you cream cheese with higher protein per serving, yet with lower fat and sugar than traditional cream cheese. An Icelandic delicacy for centuries, skyr is well-known in Europe, where Arla markets a drinkable skyr yogurt. 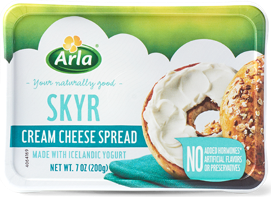 New Arla Skyr Cream Cheese is made with Icelandic-style yogurt, which has also grown increasingly popular in the U.S. as the trend for higher-protein dairy products has caught on with health-conscious consumers. Made with skimmed milk instead of whole milk, Arla Skyr Cream Cheese is naturally produced to be thick and filling with fewer calories. As with all Arla products, Skyr has no artificial flavors or preservatives and few ingredients: buttermilk, skyr (skim milk, cheese culture, rennet), cream, milk protein, salt and cheese culture. A 2-tablespoon serving contains 45 calories, 3 grams of fat and 3 grams of protein. Arla Skyr Cream Cheese comes in an Original flavor, joining five flavors of traditional cream cheese: Blueberry, Herbs & Spices, Mediterranean Garden, Original and Strawberry, all of which come in 7-ounce tubs. 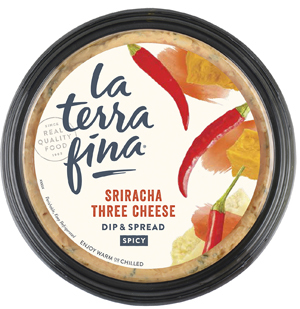 On the heels of its 2017 brand and packaging refresh, La Terra Fina, the 35 year-old company known for its flavorful refrigerated dips and quiches, is expanding its robust line of dips and spreads to include two new craveable offerings. The dips are free from artificial colors, flavors and preservatives. Consistent with the full line of La Terra Fina dips and spreads, they are certified gluten-free and made with dairy from cows not treated with artificial growth hormone. A 10-ounce package has a suggested retail price of $4.99. To read more about this product, link HERE to the April 20, 2018, blog titled "Contemporizing Curd." A&M Gourmet Foods introduces Simply Simple Kefir + Overnight Oats. “Rethink the way you eat” is the brand’s tagline. With this recent innovation, it’s a new approach to a wholesome homemade breakfast. The ready-to-eat product is gluten-free rolled oats blended with kefir and real fruit and/or spices. The individual 150-gram packs contain 140 to 180 calories, 2 to 2.5 grams of fat, 12 to 17 grams of sugar, and 3 to 4 grams of protein, depending on variety, of which there are five. They are: Apple Cinnamon, Blueberry, Chai, Field Berries and Matcha. Made with GMO-free ingredients, all five varieties are a source of iron and low in sodium. The unique package includes a spork (spoon/fork) for on-the-go dining. The HP Hood LLC family of brands grows its Heluva Good! dip line in the U.S. 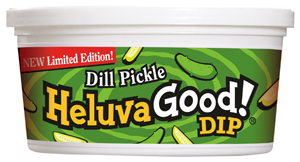 Already a top seller in Canada, Heluva Good! has finally brought this on-trend flavor to the U.S. market. The company is producing this flavor in its Arkport, N.Y. facility. For now, it’s a limited-edition release. This sour cream-based dip contains bold spices that savor with tangy flavor. A 2-tablespoon serving contains 60 calories and 4.5 grams of fat. A 12-ounce tub sells for $2.19. RifRaf introduces dual-compartment Ricotta Cups. The dairy aisle is getting a shakeup with the launch of RifRaf Ricotta Cups, a first-of-its-kind ricotta cheese snack. Combining spoonable, lightly cultured whole milk ricotta and a sidecar of adventurously flavored jams and honeys, RifRaf is positioned to upset an otherwise uniform yogurt category. The concept for RifRaf Ricotta Cups came to David Eisenman, CEO of Brooklyn, N.Y.-based creative agency Madwell, the way lots of good ideas do. That is by accident. “Believe it or not, RifRaf came to me as I was making lasagna in my kitchen, eating spoonfuls of ricotta cheese and thinking how well this would pair with honey,” says Eisenman. Eisenman immediately shared the idea with longtime friend and business partner Chris Sojka. “He talked me into buying a pint of ricotta to see what’s out there, and I instantly thought it would be something exceptional to snack on,” says Sojka. Confident there was an opportunity to give consumers a new take on a snackable dairyproduct, the two tapped Chef Will Hickox to help bring that vision to life. With his background in recipe development and years of experience in the restaurant industry, including a notable position at Blue Hill, Hickox, too, recognized that the category was ripe for something refreshing. The team spent months perfecting the texture and flavor of the ricotta. The result: a fresh, fine-curd texture with a subtly salty-sweet ricotta base that can easily pair with a whole range of curated jams and honeys, including some of the savory flavors consumers might experience in a restaurant. RifRaf Ricotta Cups is launching in five flavors. They are: Meyer Lemon, Serrano Pepper Honey, Strawberry Balsamic, Sun-Dried Tomato and Wildflower Honey. The product comes in 4.6-ounce dual compartment cups and retails for $3.39. Green Mountain Creamery introduces skyr, which is “Born in Vermont. Raised on Good Nature,” the brand’s tagline. The new skyr comes in plain and four flavors. They are: Key Lime, Salted Caramel, Strawberry Cream and Vanilla Bean. The flavored varieties come in 5-ounce containers, providing 150 to 160 calories, 4 grams of fat, 12 to 13 grams of sugar, and 12 to 13 grams of protein. Plain and Vanilla Bean come in 24-ounce containers. 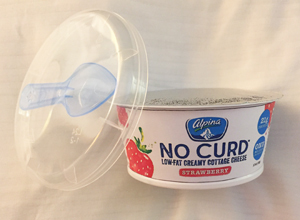 Alpina introduces No Curd Cottage Cheese. This high-protein dairy snack is made with blended 2% milkfat cottage cheese, which yields a spoonable cultured dairy product with a unique texture, one without distinguishable curds. 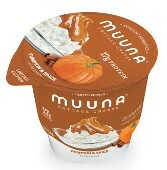 Made with all-natural ingredients, and probiotic cultures, the 5.3-ounce single-serve cup includes a spoon in the lid. The plain variety contains 25 grams of protein. It’s also available in a 16-ounce multi-serve container. There’s four blended fruit options, all delivering 21 grams of protein, 130 calories and only 4 grams of added sugars. The fruit varieties are: Blueberry, Peach, Pineapple and Strawberry. For more information on this product, read the Macrh 9, 2018, link HERE to the blog titled "Innovation Knows No Limits at Expo West 2018." To read more about this product, link HERE to the March 2, 2018, blog titled "Expo West 2018: Protein Preview." 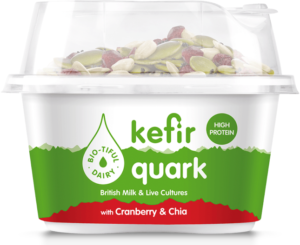 Bio-tiful Dairy introduces Kefir-Quark to the U.K. marketplace. Free from any artificial colors, flavors, preservatives or added sugars, the 150-gram cups of kefir and quark made with British milk contain probiotic cultures, including Bifidobacterium, Lactobacillus acidophilus, Lactobacillus plantarum, Lactobacillus casei and Lactobacillus rhamnosus. The original variety contains 90 calories, 18 grams of protein, 0.6 grams of fat and 3.5 grams of sugar (inherent to the milk). The Cranberry & Chia variety has a dome cup with a topping composed of dried cranberries, chia seeds, pumpkin seeds and sunflower seeds. Each cup contains 191 calories, 21.4 grams of protein, 7.2 grams of fat and 6.7 grams of sugar (inherent to the milk and the topping). Dean Foods introduces DairyPure Mix-Ins. 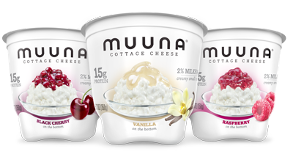 The new line of 5.3-ounce cups of cottage cheese come in four varieties. Two are simply fruit with the cottage. These varieties are Blueberry and Pineapple. The other two are fruit with cottage cheese, along with a dome of a crunchy inclusion. The varieties are: Peaches with Pecans and Strawberries with Almonds. A single-serve cup contains 15 to 17 grams of protein, depending on variety. 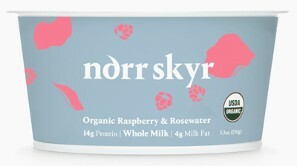 The New Nordic Dairy Company grows its skyr line up. Norr Skyr is made by a couple of young dairy men from Scandinavia. Though their strained cultured products are rooted in Scandinavian dairy tradition, the traditional and whole milk single-serve containers of skyr are manufactured in Upstate New York using the finest local milk from 19 organic family farms. The farms are small with an average herd size of 25 cows, and are given access to pasture year round and fed a grass-intensive organic diet. The original nonfat line comes in Blueberry & Lavender, Elderflower, Gooseberries, Plain and Sea Buckthorn varieties. The new whole milk line comes in Black Currant, Matcha, Plain and Raspberry & Rosewater varieties, with the flavored options touting wellness benefits. Black currants contain twice the antioxidants of blueberries and four times the amount of vitamin C found in oranges. Matcha is potent in antioxidants and amino acids. Rosewater is beauty potion with anti-inflammatory qualities. All of the skyr products come in 5.3-ounce containers. 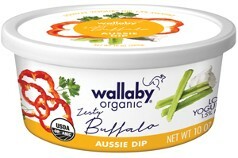 DanoneWave introduces Wallaby Organic Dips. The new refrigerated dips start with a base of Australian-inspired nonfat yogurt. The 10-ounce plastic tubs will debut in three varieties. They are: Everything Bagel, Spicy Red Pepper and Zesty Buffalo. A 30-gram serving contains 0 to 0.5 grams of fat, 20 calories and 3 grams of protein. 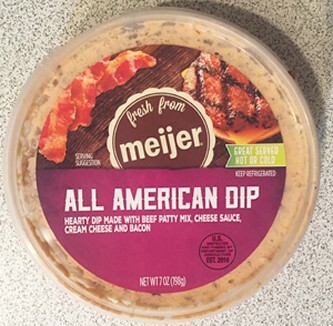 Grand Rapids, Mich.-based Meijer recently introduced some hearty dips ideal for Super Bowl snacking. Merchandised in the self-service deli department, the “fresh from Meijer” line of meat-infused dairy-based dips come in All American, Buffalo Style Chicken and Pepperoni Pizza varieties. Sold in 7-ounce clear plastic containers, with a callout to serve hot or cold, having meat as the number-one ingredient keeps calories and fat content down while boosting the protein content of what is normally a high-fat chip accompaniment. A 2-tablespoon serving (28 grams) contains 50 calories, 3 grams of fat, 2 grams of carbohydrates and 3 grams of protein. This is not your typical chip dip. It’s a paleo follower’s indulgence. All of the dips carry a U.S. Department of Agriculture (USDA) inspection stamp of approval because of the meat ingredients. It is important for non-meat processors to note that including meat and poultry ingredients in non-meat foods often requires USDA inspection. The regulations exempt meat and poultry products from inspection if they contain very small quantities of meat and/or poultry ingredients. These quantities are 3% or less raw meat; less than 2% cooked meat or other portions of the carcass; or 30% or less fat, tallow or meat extract, alone or in combination. In the case of poultry, these quantities are less than 2% cooked poultry meat; less than 10% cooked poultry skins, giblets or fat, separately; or less than 10% cooked poultry skins, giblets, fat and poultry meat (limited to less than 2%) in any combination. For dried products containing poultry, these percentages are computed on the basis of the moist cooked chicken in the ready-to-serve product when prepared according to the directions on the consumer package. Also important to note, these are not international exemptions; therefore, foreign countries may require USDA inspection stamps if a product contains any amount of meat or poultry ingredients. Gerard& Dominique Seafoods introduces Smoked Salmon Lox Schmear. This new cream cheese-based schmear contains chunks of the company’s signature European-style lox with a hint of lemon. It’s free of artificial ingredients. The 6-ounce product ships frozen and has a two-week refrigerated shelflife. 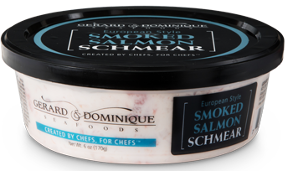 The schmear joins the company’s cream cheese-based mousse products, which come in smoked salmon and halibut varieties. Lifeway Foods now offers traditional Icelandic-style skyr. Known for its rich flavor, creamy texture and potent health benefits, skyr has been a part of Icelandic cuisine for centuries. Made in small batches, Lifeway Skyr contains 14 probiotic cultures, including 2 strains that are essential to authentic Icelandic Skyr. 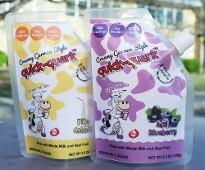 The cultured dairy product is made with organic whole milk and packed with 18 grams of protein. There are five varieties. They are: Ancient Grains, Blueberry, Honey, Plain and Wildberry. The organic skyr is sold in a resealable cup with a spoon for a suggested retail price of $1.99. To make its new Blue Cheese Roasted Pecan Dip, private-label retailer Trader Joe’s combines blue cheese crumbles and chopped pecans with cream cheese and sour cream. Roasting the pecans provides extra flavor, as well as locks in some crunch. The dip is considered a premium product thanks to the visually appealing crumbles of cheese and decent-sized pieces of pecans. This perishable, refrigerated savory condiment complements crackers, as well as veggies, and also functions as a sandwich spread. Sold in 8-ounce tubs, a 2-tablespoon serving contains 110 calories. Dairy and Food Communications, Inc.